Español: Felipe II de España (Valladolid, 21 de mayo de 1527 – San Lorenzo del Escorial 13 de septiembre de 1598) Rey de todas las Españas y las Indias. 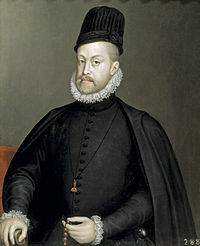 English: Philip II of Spain (Valladolid, May 21, 1527 – San Lorenzo de El Escorial September 13 1598) was the first official King of Spain from 1556 until 1598, King of Naples and Sicily from 1554 until 1598, King consort of England (as husband of Mary I) from 1554 to 1558, Lord of the Seventeen Provinces (holding various titles for the individual territories, such as Duke or Count) from 1556 until 1581, King of Portugal and the Algarves (as Philip I) from 1580 until 1598 and King of Chile from 1554 until 1556. He was the only legitimate son of Holy Roman Emperor Charles V.
Pages in category "Philip II of Spain"
Media in category "Philip II of Spain"
This page was last edited on 14 October 2018, at 16:19.